During the regular meeting of the Staunton CUSD #6 Board of Education held on Monday, November 19, 2018 the Board held a discussion regarding the School Report Card and District improvement. The Illinois State Board of Education (ISBE) released the District’s annual School Report Card on Oct. 31. The Report Card shows how well schools are progressing on a wide range of educational goals. “After years of underfunding and being identified as one of the Tier I districts in the greatest need of financial support as we sit at only 58% of funding capacity to meet expectations, we now have the opportunity to drive our resources to the students and areas in most need through evidence based funding. Know that our schools are continuing to do their best work and we have much to celebrate,” Superintendent Cox stated. Each school’s Report Card also now includes a designation, a descriptor of how well our schools are meeting the needs of all students, based on 10 measures of performance, including growth. “Our designations are not a descriptor of how our schools are doing overall, but instead are descriptors of how one specific group of students are performing compared to all students statewide while representing only one moment in time. Improvement begins with taking an honest and comprehensive look at where we are, so we can chart the path to where we want to go,” Cox stated. The next step in that plan of action is the District improvement process that begins with a collaborative needs assessment, utilizing the IL Quality Framework and its' Supporting Rubric. Through this process the District has identified Culture and Climate as the top school improvement priority. In other action the Board reviewed the presentation of the 2018 tax levy. It is important to note that the Board does not set or raise taxes through the levy. Instead, the Board raises the levy so the District can capture all of the revenue it is entitled to receive per law. The public hearing for the levy will be held Monday, December 17, 2018 at 7:00 p.m. in the Unit library. The Board held a discussion regarding the possibility of forming an interscholastic cooperative agreement with Mt. Olive High School for IHSA football. There are currently six interscholastic cooperative agreements in place between the two districts. This interscholastic agreement is a two year agreement that would allow students from Mt. Olive High School to participate on the SHS football team. The Board decided to table the discussion until a decision comes down from the Illinois High School Association regarding a transition to district play. More information from that decision is needed before any final action can be taken. The following personnel action was taken following closed session. The Board recognizes the retirement of Dave Williams effective immediately as a bus driver for the District with thanks for service. The Board recognizes the retirement of Patricia Lenzen as an elementary teacher effective at the end of the 2018-2019 School year with thanks for service. The Board recognizes the resignation of Vickie Senaldi as SHS Asst. Softball Coach with thanks for service. Supervisory Aide – There have been no applicants for the position. The Board approves an unpaid leave of absence for Diane DalPazzo from November 19, 2018 through December 17, 2018. 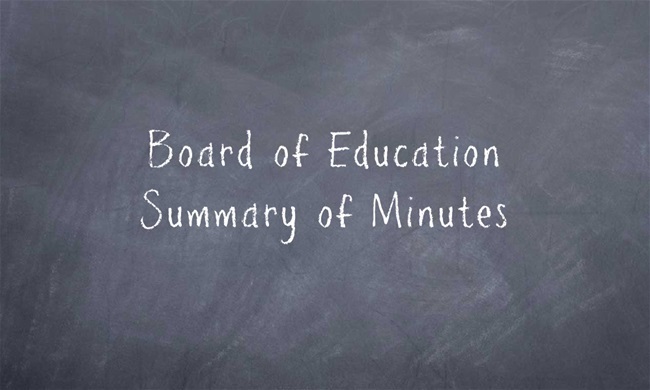 For additional information about all discussion and action items that occurred during the meeting please view the summary of minutes.